As I keep digesting the news that Wizards of the Coast is already working on a follow up edition to 4e , my mind is wondering how and what they can do to accomplish the goal of bringing back fans of all previous editions under this one game. It’s a lofty goal, and I’m skeptical that it can be done, but I’m also willing to give them the benefit of the doubt because I believe that the team they have in place (Mearls, Cook, Cordell, Schwalb) is about as good a D&D dream team as you can get right now. One of the big issues that seems to bother lots of older edition players is the fact that WOTC refuses to sell the pdf’s of the older material. I’m not sure why they do that. Piracy? Perhaps, but before I don’t make a single dollar, I’ll try to at least make one. It doesn’t cost them anything to have that material up and available for purchase, if one guy pays it’s one dollar more than if you had the files under lock and key in a vault. At this point, who cares? It’s not like all those files aren’t out there being pirated daily anyway. If one guy pays your for it, take it and smile. But if WOTC has their rational for removing these products from the market, then so be it. At the end of the day it’s their prerogative. Sell me cheap stats for the new edition! One of the things I think would be interesting for them to do when the new edition launches is to make some of the older edition material relevant again via cheaply priced documents that update the stats of old adventures up to the new edition format. So for example, if I have a copies of “Expedition to the Barrier Peaks” and the original “Ravenloft” modules that I’d like to run with the new ruleset, I could go to their online store and say for $1.99 or $2.99 I could purchase a document with the stats for either module updated to the current edition. I’m not talking about selling me the whole module now, I mean literally a four or five page document with party level information, npc’s, monsters, and traps that I just need to plug into the story and play. I think it’s fairly easy to do, could possibly make many people open up boxes in their garage to find something to run with their shiny new rules, and could lead the way in opening the door a bit to selling full-fledged pdf’s of the entire almost 40 years history of D&D. ← So what will happen to the Forgotten Realms? I would love to get updated stats to the original Ravenloft adventure for one. New Planescape stuff would be really neat too. I have heard a lot of good things about Spelljammer and if I had access to that stuff I’d probably enjoy it too. Basically I like this idea and I would probably buy at least the Ravenloft one I’ve wanted to run it for a while. Yes, yes, and yes. In fact, I think they should sell PDF versions of all of their books. I would certainly buy them. I have homemade PDFs of some of the recent books, and they are godsends as a person who lives in a small New York apartment with absolutely no shelf space. There were a couple of Dungeon articles that were basically updated monster stats for older adventures, like Last Breaths of Ashenport. Wonder why they never did more of that. They are afraid of piracy yes, but they are also afraid that a dollar spent on the old stuff is not being spent on the new stuff. The actual situation for me is that the dollar that I might have spent with WotC is now spent at Paizo where I get the PDFs bundled with the subscription. If they made the whole back-catalogue available as PDF/ePub, I’d be a customer again. I don’t care if it is encrypted/watermarked. I don’t think that it would harm sales of dndnext – I think it might actually drive them if people can get an official old-school fix over the next year. I think it is an awesome idea. I was actually shocked when I started playing again after 25 years that they hadn’t already done this. Get with the future WoTC! Make what was old, new again. I agree with you David that the reason is probably they don’t want to compete with their own new products. The thing they forget here though is that a lot of those older modules were not only bought to play, but also because people love to read them! They are great books to get your creativity running, with lots of fluff. So you wouldn’t just buy enough so you can run your next campaign, you (at least I) would buy a LOT more of them :). The stat conversion I would not be interested in. I can easily do that myself, without a lot of effort. Plus I like creating monsters ;). For me it’s often the story that is problematic to create. To make the adventure feel alive and real, instead of a bunch of encounters I came up with, and an excuse to drive my PCs through them. It sounds really cool. Maybe not achievable, but cool. See, I think that is a really good idea. I understand the position that they’re not putting out their old material in pdf because of piracy – having been around the scene it’s something a lot of people do. But I think you’ve got an interesting idea here, not only with updating some of these old modules and selling them cheaply but simply putting up the old modules as cheap little micro payments. I think the majority of people would be hardpressed to go out of their way to try and pirate a 2 or 3 dollar pdf. Plus it would be so much easier to get the material in a tablet for a quick and easy reference at the table without having to go through a bin of books. I’ve got to say that I don’t really know how I feel about dndnext. There is an edition for everyone, so I think the most sensible route is to try and support different editions simultaneously. I still play AD&D 2E these days but it’s been a while since I’ve given them a dime for new material. I tried 4E and Essentials, but it just didn’t appeal to me. Piracy struck me as an excuse, not a real reason. The pulling of the PDFs from RPGNow came when 4th edition books showed up as torrent downloads. That was when they shut down the RPGNow downloads, but much like the turn from OGL to GSL for the 4th edition material, the decision to dump PDFs seemed like something that was being driven by marketing reasons rather than concerns over piracy. After all, all that pulling the PDFs down did was eliminate a revenue stream. The material is still being pirated, Wizards just has no way of getting any money out of it at all now. They really do need to put the older stuff back “into print” via digital download. I suspect that they could be doing quite well with Nook and Kindle Fire downloads right now if people could go to B&N or Amazon and download old modules for $5 (which was actually cover price when I was a kid – sigh) or old sourcebooks for $10 or old boxed sets for $15. One thing to keep in mind, though, is that “new stats” aren’t going to be enough for a transition across editions. The entire mindset of “game balance” and encounter building between pre 3rd edition and post 3rd edition is different. It’s obvious with 4th edition (where they make a big deal out of building encounters) but it’s true of 3rd edition as well. When 3rd edition came out I attempted some straight-up translations of the Caves of Chaos, The Lost City, and The Palace of the Silver Princess (3 of my favorite 1st level adventures) – even as 1st level adventures you have to rethink everything. So if the new iteration is closer to 3rd/4th edition in mindset when it comes to character advancement and encounter planning, an “upgrade” of the older material is more than just new stats (see the version of Against the Giants that Wizards put out in Dungeon as an example). Refusing to sell the PDF actually encourages piracy, not prevents it. Stupid, stupid WoTC. @Jer you should update those $5 for inflation, though. While I understand how great it would be for none of our D&D material to ever go out of date, I think the simple reason for them not to do this is they don’t want to encourage people to use older material, even with the new rule set. Is that the right choice? Not necessarily. Pathfinder showed that that isn’t always the case. The simple fact is that gamers want it both ways. They want their game to be well supported with errata, tools and so on, but they want to not spend money. In order for WOTC (or any company) to continue with D&D, they need to make money at it. That means new editions.If you don;t mind unsupported (or less supported) products, there are many out there. As far as a new rule set is concerned, I am very excited. I like seeing what new changes are being made. If you hated 4e, then maybe they’ll make it more to your liking. If you loved 4e, then maybe this will be an even better evolution. The possibility exists that it can go either way. I think that some will like it, some will hate it, some will paly it regardless because it’s the latest and some will stick with an alternative. WOTC has no choice but to put out a new edition as 4e is losing ground. I think the official reason for current content not being in PDF format was Piracy. I suspect the unofficial reason was pressure from gaming stores not to sell material on the WoTC website, which means players have to get their content from a local gaming store. Just look at the fact that when you look up a product on the WoTC website, it doesn’t have a “Buy this online” button, it has a “Store Locator” button. As to why they won’t sell older content, that makes less sense, but might be pressure from Hasbro, who would be more interested in enforcing sales of newer content and ignoring older content. All of which I think was a mistake. I’m all for it. I have a bunch of 1st and 2nd ed. adventures I’d love to run, again, but I’m too lazy to convert stats (especially that weird time where every stat had 18(1-00) options). I’d pay three bucks to get an updated creature list. On top of that, I’d pay a new cost for some old ones I want to play, now, that I didn’t buy then. Lots of Ravenloft stuff, for example. As a note, there may be a subtler force at work, preventing the release of those PDFs. Namely, that WotC doesn’t have the rights to. TSR went through a couple of periods where they were total crap at keeping records of their contracts for things like art. They discovered this when they released the first 250 issues of Dragon on CD, only to discover that they were actually pirating themselves. They didn’t have the rights to republish a large number of those pieces (art, fiction, etc.). It was a total nightmare for them. Re-publishing all of that old material is also not as simple as pushing a button. Some of it probably does not exist in electronic form currently. Even what does would likely be well served with a little retouching, and would need to be converted to PDF. Sure, that’s only a few hours work. For each and every module. That’s a lot of man-hours to sink into a project that has a small revenue stream and isn’t popular with either the lawyers or the marketing team. Of course, if WotC was really smart, they would out-source that to some hungry start-up. I’m sure there’s a group of college kids kicking around the Northwest right now that would be willing to do it for pennies on the dollar. Still a legal tangle, but it would serve to generate the goodwill and good publicity in the community with little actual cost to WotC. pdf’s are a great idea, and make a lot of sense to me. I would pay $5 for a download and never hassle with pirating the content for free. It’s worth $5 to me. Lugh makes some good points as well. I think that an eager group of kids would happily create stat blocks for old materials. Imagine if they would construct a site that operated like wikipedia. People could just drop in when they want to, and update the content. It would be very helpful to have the maps from every module, and that should also be included with any wiki type environment. This public available content could be created for any fantasy gaming system that you prefer to play. I play Pathfinder and would lean toward a Pathfinder-based wiki for very old D&D content. This is an amazing idea. I would buy a BUNCH of stuff in that model. As to why they don’t have old pdfs for sale, it’s not about piracy, although that doesn’t help. It’s because if they are actively selling material for any previous edition it is seen as directly canabilizing current edition market share. 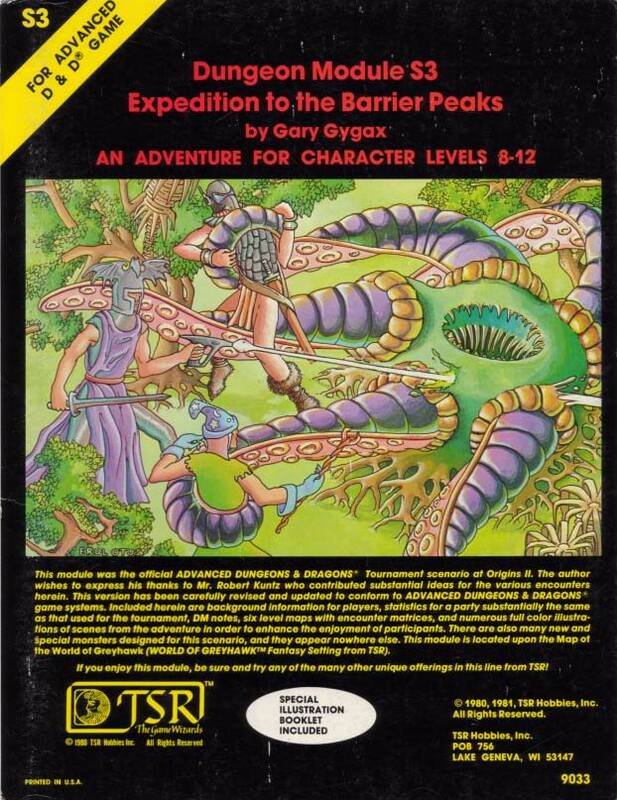 If you can still buy pdfs for AD&D you are less likely to upgrade to 4E (or 5E now). I know that if there were still supporting AD&D with some new material I’d probably just keep playing that for every. But since there’s no support for it, groups are harder to find and I just ho-hum upgrade to 4E and call it a day. I agree with the need to update the old modules, but there are two things going against it. First, my guess WOTC sees these as valuable IP, and would rather rewrite the module for the new rules and sell 3,000 of them in hardcover format than sell 300 PDFs. Second, I just can’t see it being cost effective for them to publish stats for these old modules for 3-5 dollars. They’d have to sell a lot of them to make back the cost of the writers, designers and editors necessary to update each module. What I’d like to see instead is a crowdsourced option, where wizards runs a wiki-like website that people can post their mods and stats for the current version of D&D for these old modules. If this website is actually curated by a WOTC employee, that would be even better, to ensure a level of quality. Plus, wouldn’t that garner a lot of good will with a lot of people in the community? If a conversion doc is needed to run old modules then I will consider 5E a dismal failure. It’s completely unfair to expect a system compatible with every dnd without some sort of conversion. Your expectations are way out there. Just math wise alone every system is different. But haters gonna hate…. So, Aplus, how do you propose we deal with THAC0 vs. the new combat system? Negative AC being a good thing, as well. 18(00) strength… are they just an 18, now? The step from 3rd to 4th may be doable without a conversion doc, but from 1st and 2nd to 3rd is impossible. I didn’t say that it shouldn’t require any conversion, I said it should not require a conversion document. Today, I can run this in any edition, with the exception of 4th, easily doing any necessary conversions on the fly (meaning that the conversions are extremely simple). Perhaps coming from a 4E mentality, what I am saying seems like a lofty goal, but it is really a very simple thing. It is not unfair at all to ask for things to be simple enough to do in your head, and I can say with certainty that if they don’t deliver on this, many people will continue playing their out-of-print edition of choice or the retro clones. I play old school games mostly, but I use ascending AC and BAB instead of THAC0/Descending AC. The conversion is about the simplest thing you could ever do, and is easily calculated on the fly using the following formula. For AD&D its the same but the numbers add up to 20 instead of 19. I’m in the camp that believes monsters don’t need ability scores, so the 18/00 issue is irrelevant. If it becomes relevant, treating it as a regular 18 should be fine. What value is there in differentiating between 18 and 18/00? WotC’s (and others’) concern about piracy of PDFs is sensible with regard to products still being produced in print, but it seems ridiculous for products that are out of print *and never will be in print again*. Will WotC (finally!) reprint Expedition to the Barrier Peaks? Maybe, but I’m not waiting for it. I’ve been converting old modules myself, and my article (http://www.loremaster.org/content.php/239-Protection-from-Chaos-Part-IX) shows you how to do it without running afoul of copyright law (making your request for them selling stats moot). Still, it would be easier if WotC produced it themselves. I love this idea. Not just the first edition stuff but the 3rd edition Eberron stuff would be awesome. I don’t have time to redo it all but would love to be able to pick it up and run. So yes, I do want to see all my favourite old modules for sale (or maybe even free! ), but WotC will have to make some kind of investment and will want to see a return on that investment. Whether that is a sound business case? Your guess is as good as mine.